Definition: The Ethnocentric Approach is one of the methods of international recruitment wherein, the HR recruits the right person for the right job for the international businesses, on the basis of the skills required and the willingness of the candidate to mix with the organization’s culture. In Ethnocentric Approach, the key positions in the organization are filled with the employees of the parent country. All the managerial decisions viz. Mission, vision, objectives are formulated by the MNC’s at their headquarters, and the same is to be followed by the host company. It is based on the rationale that, the staff of the parent country is best over the others, and also, they can better represent the interest of the headquarters. Better coordination between the host and the parent company. The culture of the parent company can be easily transferred to the subsidiary company, thereby infusing beliefs and practices into the foreign country. Effective control over the subsidiary. The parent company can have a close watch on the operations of the subsidiary. Better transfer of technical know-how. Effective communication between the host and the parent company. No need to have a well-developed international local labor market. The staff of the parent country may find it difficult to adjust in the host country due to the cultural differences. 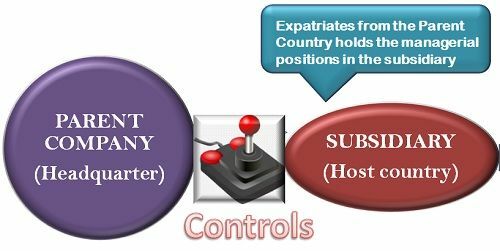 Difficulty in guiding employees living far away from the parent country. Missed out the opportunity to hire the best personnel from the host country. The cultural clashes between the executives of parent country and the staff members of the host country. The expatriates from the parent country are much expensive as compared to the employees in the host country. The government restrictions in the host country may hamper the business of the parent company. The failure rate is very high. This approach is beneficial in a situation when a new subsidiary is set up in the host country, and the employees of the parent company visit there and initializes its operations.